Mandy Seymour specializes in helping others discover and enjoy our amazing world and life's most meaningful moments. Born and raised in Houston, Texas, Mandy received a B.A. in International Studies and Spanish from Trinity University in San Antonio, Texas and earned her Masters of Theology at Dallas Theological Seminary in Dallas, Texas. An avid writer and photojournalist, Mandy blogs about travel at www.MandySeymour.com. Mandy Seymour writes and speaks on a variety of topics, from travel to love to everyday life. In doing so, she earnestly desires to make the world a better place and to enrich the lives and insight of others. For my daughter’s birthday, I promised her a golden retriever puppy. I started my puppy search a few months before. But nothing felt right until I met the Behrens. They are a family who has just a few litters a year of precious white Golden retrievers which are among the loveliest and most beautiful dogs we have ever seen. My two little girls and I visited their family farm and fell in love with all their puppies. Here is our story. If you have a puppy promise you are looking to fulfill or want to find a good family dog, we recommend Behrs Family Goldens. To find out more, email me. Do you want to know deeper love for God, yourself, and others? The Deeper Love Conference is coming to Houston, Texas in September 2017. Are you ready for Deeper Love? Find out details here. Looking for the perfect Valentine’s gift? My new book on love just came out! Find it here. Yesterday, Radiance our Golden Retriever, was leaping and bounding playfully in the yard, scampering around with glee. She ran up the hill to the neighbor’s house. When she came back down, she was foaming at the mouth, kept falling over, and suddenly became paralyzed. We looked into her eyes and could tell she was not in her right mind. We didn’t know if she had rabies or had been poisoned. Something was very wrong. She snarled at my father when he approached her. He made a long pole with a noose-like structure so he could grab her from a distance. We took her to a local vet which has been in Tomball for many years called Kasper and Rigby. We made an urgent plea for them to look at our dog right away. The front office girl told us coldly that they could not fit us in, as they were full. Then she told us it would be 2 hours. She also stated that they did not have the ability to treat her in an emergency – which surprised us — and they weren’t even wiling to look at her. “What if she dies?” I asked. The girl was apathetic. The other office staff and nurses looked at me blankly. We used this vet long ago, but apparently customer service and compassion is not a priority for them. “We can’t wait two hours!” I said. She said, “Then take her to an emergency clinic.” That’s easy for her to say – because she wasn’t the one who was going to have to pay several thousand dollars to go to an emergency clinic. We knew if they had just been willing to look at her, they would be able to figure out what she needed. But Kasper and Rigby were not willing to save our animal’s life in the moment. My father had visited My Family Vet with a friend and recommended we take her there. He said that the front office staff and vets had been very caring, accommodating and gave good treatment. On the way there, we prayed that God would intervene and help to heal our precious dog and put her in loving hands for care. In answer to our immediate needs and prayers, the staff at My Family Vet were loving, compassionate, caring and concerned – and willing to treat her urgent situation. The vet cared for her in a kind and thorough manner. He assessed her situation efficiently and accurately. He determined that she did not have rabies but rather had eaten a highly toxic plant called sego palm – lots of it. He induced vomiting and gave her an iv to flush out the rest of the sego seeds. My Family Vet is the best vet we have ever had. Their motto is “We treat your pets like family.” They do! They could not have been more loving or caring. Their services and treatment were reasonably priced. We highly recommend them to anyone. Love came down at Christmas. I grew up singing a hymn about it. Love came down at Christmas. Jesus came into the world and the world was never the same. When I imagine what it would be like to have been there the day the Savior was born, my heart is filled with reverent awe and wonder. Yet what is even more amazing about Jesus’ birth is that He came into the world so ultimately we could be born in Him. From our mothers and fathers, we are born of the flesh. But when we believe in Jesus as the Christ, we are born of the Spirit. May we soak in the precious truth of His love and care for us this holy holiday season. 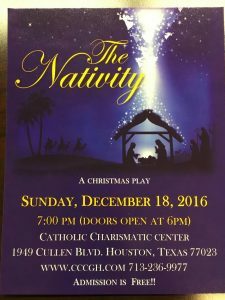 To experience the fullness of this holy season, we encourage you to attend The Nativity, a Christmas play hosted by the Catholic Charismatic Center in Houston, TX on December 18, 2016. The play is directed by Salisha Miller and features a multi-ethnic cast, in keeping with Salisha’s belief in inclusivitiy in the arts. Read more about inclusivity in the arts here. Find more information on The Nativity at the Catholic Charismatic Center here. When a traveler returns from vacation, we are all eager to tell others about our travels. People want to know about your trip, but they may not want to know as much as you want to tell them. They do not want to see a 300-picture slideshow laden with moment-by-moment details. They don’t have the time to do so. But they do want to hear about your trip. If you want to have an audience of attentive listeners who really want to hear about your travels when you return, take pictures that tell a story. Bob Gomel has had legendary experiences of his own. He photographed Marilyn Monroe, The Beatles, John F. Kennedy, and many other noteworthy people during key moments in history. He did not know, necessarily, that they were historic moments at the time. And neither do you or I, today as we click, click, click away. So don’t just take a picture of the moment. Tell the story. Capture the experience. Snap away! Then select your 10 best.photos. This will be a combination of your favorite photos and photos that convey the story you want to tell. And keep them on hand for anyone who asks. Story pictures bring your trip to life for someone who was not there. And they will love it. Give it a shot. And let me know how it goes! Read more about the story behind this photo here. Read more about Bob Gomel here. While visiting The Netherlands, I took a tour of Amsterdam’s Red Light District. Photographs were not allowed. So for anyone wanting to better understand human trafficking, I thought it might be helpful to write about what I observed. Two views circulate widely about Amsterdam’s Red Light District – and prostitution in general. The first view is that women are prostitutes by choice. They do so because they want to. They make good money. It’s an age-old profession and a career. They enjoy what they do. aced indicating most women do NOT engage in prostitution by choice. According to Human Trafficking expert Dottie Laster, most women do NOT choose to be prostitutes. They are forced, coerced, conned and manipulated into doing so. Then they are trapped and faced with threats by pimps and handlers who tell them if they don’t, the person will harm them or their loved ones. Which is it for The Red Light District in Amsterdam? Our guide – who had an air of handsome thuggishness — represented view 1 over and over again. He told us the girls liked their trade, they were proud of it, they enjoyed it, and many of them even did it on the side in addition to a day job because they enjoyed it so much. However, their faces tell a different story. When I saw the girls for myself – standing behind large glass viewing windows scantily clad, wearing high heels, standing on red carpets – I looked into their eyes and saw a different truth. Judging by their body language – crossed arms, wide eyes stares, a stone-faced drawl – they were not enjoying themselves. They were petrified or resigned. Some looked playful, but it was only an act, as there was no light in their eyes. When people truly enjoy something, they often have a brightness – a twinkle – in their eyes. They do not enjoy it. That is just wishful thinking on the part of those who choose to believe it. I looked straight at our guide and asked him, “How do you know they want it? Like it? Enjoy it?” He said, “They want it because they want the power or they wouldn’t do it.” This may the reason he does whatever he does. But most women are not like that. In fact, in prostitution, it is pimps, not prostitutes, who wield power. Most people do not realize this because just like malicious spyware, the pimps are quietly in the background making invisible threats to the women causing damage that is not readily apparent to onlookers. Some of them looked very sad, many of them looked frightened, and most of them had a look of deadened resignation in their eyes. On our tour, we visited a Museum of Prostitution where they showed us what the rooms were like. They explained hygiene procedures. And they, in essence, glamorized prostitution. But as many human trafficking experts will tell you, there is nothing truly glamorous about it, despite what many want to believe. Rather, it is forced slavery taking place in the modern day. I know it’s difficult to believe. But it’s true. Pimps strategically select and coerce women and young girls into prostitution. And once their girls have been coerced in, they become afraid to leave. But it can be done. I have met former prostitutes who decided to risk leaving their pimps and their “profession”. They are so glad they did because now their lives are in a better place. As for Amsterdam, the Red Light District is an illusion. There is no real pleasure there. It is a place of silent despair. Don’t let yourself be fooled. Just look into their eyes and you will see a different story. My album Love without Fear is here. I’d love for you to check it out and let me know what you think! Find it here on Amazon.com. Here are the stories behind the songs on Love without Fear. I wrote this song about someone I was madly in love with. He said he loved me, too. But he didn’t pursue me the way someone who loved would. He was just a talker of fantasy, devoted only to his own desires, not to love or me. In my quest to find true love, I have discovered true love is found in the one who calls to the depth of our souls with His love: Jesus Christ. He calls us from darkness to light, from despair to hope, from death to life. I was inspired to write this song in response to the shallow, catty ways women interact with each other – even religious people. Most people have some insecurity they have to overcome. Love is the only way. The truth is, we can love without fear! I wrote More about a guy named “Shade” I had a crush on in college. He was such a cool dude. And he had a great smile, not to mention such a cool name. Every time I saw him smile, my heart felt that lilt of joy you feel when you see someone you like or love. But he always seemed to have his eye on other girls. I don’t know if he ever even noticed me! Love is a mystery. Christ’s love is the most mysterious love of all. In fact, He is mystical. He is the most faithful friend. He loves without end. Who does that? I can’t explain Him. But I trust Him. Love Without Fear music and lyrics by Mandy Seymour. Copyright 2016 Mandy Seymour. All rights reserved. I am excited to announce my new book, 10 Best Chocolate Recipes. Through the years, I have tasted and collected some of the most delicious and chocolatiest chocolate desserts you will ever find. This book is a collection of my absolute favorite chocolate recipes. They will make a lasting memory for any occasion! My favorite recipes of all time is the Homemade Chocolate Pie. It is the most delicious chocolate pie I have ever tasted. Chocolate completes the joy of any meal. It lifts the spirits. And shared chocolate experiences create a lasting memory and legacy of love. Find 10 Best Chocolate Recipes on Amazon here. Mandy Seymour is an author whose writings and life are devoted to helping people live a deeper, more inspired and fulfilling life. Mandy has a B.A. in International Studies and Spanish from Trinity University and a Masters of Theology from Dallas Theological Seminary. Mandy lives in Houston, Texas. Mandy Seymour Copyright 2018. All rights reserved.